If you’re reading this you’re probably up-to-date on recent events, but just in case: the Delver’s Drop Kickstarter ended on March 12th after having raised an amazing $150,745 — over 200% more than our baseline goal! To say that we are amazed, humbled, and incredibly thankful would be an understatement. As if that wasn’t enough, we put up a PayPal donation method for fans who couldn’t back through Kickstarter and raised another $5,051! All set up before Day 1, taking a short break before the insanity begins. 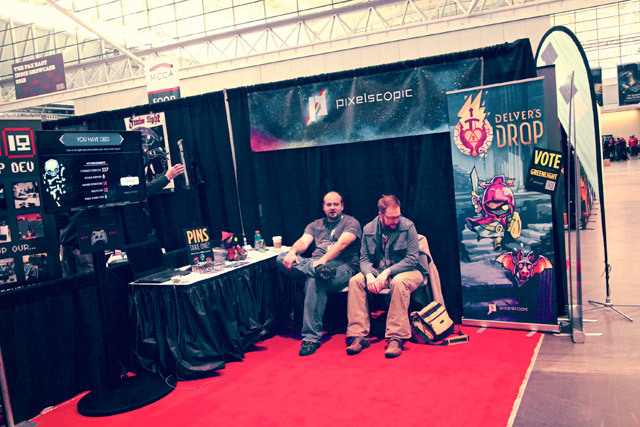 Immediately after the whirlwind awesomeness of Kickstarter, we packed our bags and headed to Boston for PAX East 2013. We were again proud to be a part of the ever-growing Indie Megabooth and enjoyed a premo spot along one of the main show floor thoroughfares. We showed off an early demo of the Endless Drop gameplay mode to the hungry masses and it was universally well-received. We had a chance to hang out with fellow devs we’ve met previously and make some new friends in the community. 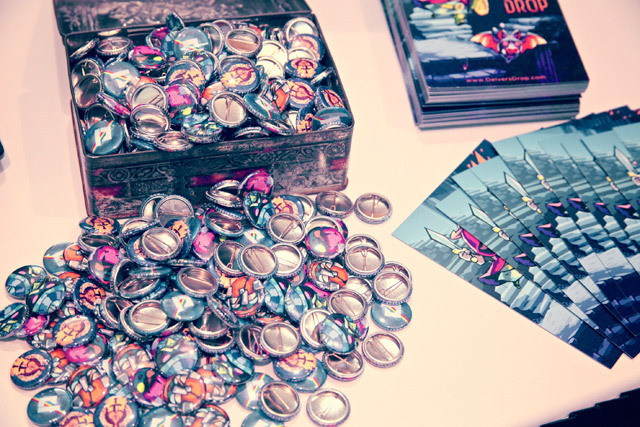 We gave out around ~5k pins. We ate some fresh seafood. It was good. As always it was incredibly awesome to meet new people; we even got a few pieces of fan art which were then carefully packaged and brought back with us to Springfield. Chatting with PAXers about our game is exhilarating - we were definitely hoarse by the end. And as always we love chatting on Twitter and Facebook! Additionally, we hope to post more musings on games and entertainment as time allows — don’t hold us to that though :) Stay tuned for more soon! This entry was posted in Business, News and tagged Delver's Drop, excitement, fatigue, full steam ahead, Kickstarter, PAX by Ryan Burrell. Bookmark the permalink.